The Hirshhorn Museum’s founding donor, Joseph H. Hirshhorn (1899–1981), immigrated to New York from Latvia when he was eight years old. His widowed mother settled with her children (Joseph was the twelfth of thirteen) in the Williamsburg section of Brooklyn. In time, Joseph Hirshhorn would become a financier, philanthropist, and well-known collector of modern art whose gift to the nation of nearly 6,000 paintings, sculptures, drawings, and mixed media pieces established his namesake museum on the National Mall. The Hirshhorn Museum and Sculpture Garden has been open to the public since October 4, 1974. At the age of thirteen, Hirshhorn left school to become a newsboy. Two years later he took his first salaried job, on Wall Street in Manhattan, earning $12 per week. At sixteen, he launched his career as a financier by using his savings of $255 to become a stockbroker. When he was eighteen, Hirshhorn acquired his first works of art: two etchings by the sixteenth-century German artist Albrecht Dürer, purchased for $75 each. This acquisition marked the beginning of a lifelong passion for collecting art, facilitated by an innate talent for making money. In the late 1940s, Hirshhorn’s mining investments in uranium-rich Canadian land cemented his status as a wealthy man. Hirshhorn eventually turned his attention to the art of contemporary masters, becoming an avid collector of works by living painters such as Milton Avery, Stuart Davis, Arshile Gorky, Edward Hopper, Larry Rivers, and Raphael Soyer. He socialized with many of these artists and assisted them when he could. For example, Hirshhorn helped Willem de Kooning, a good friend, finance the construction of a Long Island studio in exchange for works of art. As a collector, Hirshhorn was also interested in works by American painters of the late nineteenth and early twentieth centuries, including Thomas Eakins, Louis Eilshemius, Ashcan School artists, and first-wave modernists in touch with European developments. Hirshhorn was a frequent and welcome visitor in the studios of those whose works he collected, and many of these visits were commemorated with photographs. One such occasion was a 1966 visit to Pablo Picasso at Mas Notre Dame de Vie, near Mougins, in the south of France. The photographer Edward Steichen was a guest of Hirshhorn and his wife, Olga, at their house, Villa Lou Miradou, in Cap d’Antibes. Hirshhorn may be most well-known as a collector of nineteenth and twentieth-century sculpture. He acquired major works by pioneers such as Auguste Rodin and Constantin Brancusi, as well as innovative contemporaries, including Alexander Calder, Henry Moore, and Alberto Giacometti. Developing friendships with these artists, Hirshhorn showed his enthusiasm in numerous ways, such as by visiting Moore’s studio and enjoying the lively art scene with Giacometti. The breadth of Hirshhorn’s sculpture collection was unknown to the general public until 1962, when selected works were loaned to the Guggenheim Museum in New York for a major exhibition. Several international museums and governments courted the intrepid collector, but he ultimately bequeathed his comprehensive modern art holdings to the Smithsonian Institution. 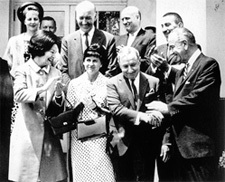 Lady Bird Johnson, wife of then-President Lyndon B. Johnson, played a supporting role by paying personal visits to the Hirshhorns. 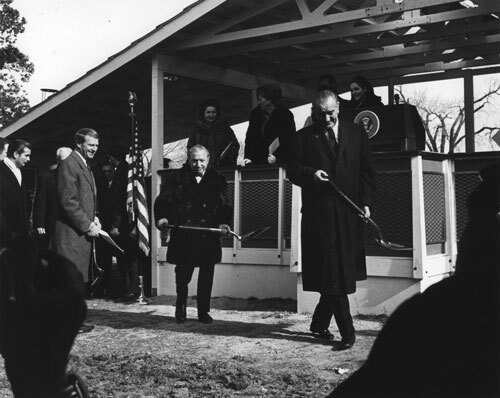 After an Act of Congress established the Hirshhorn Museum and Sculpture Garden in 1966, the Johnsons joined the Hirshhorns for the museum’s groundbreaking in January 1969, just prior to the inauguration of President Richard M. Nixon. The Horatio Alger Award, which commemorates determination, perseverance, and success in the face of adversity, was, appropriately, one of many honors with which Hirshhorn was recognized during his lifetime. Dividing his time between Washington, DC, and Naples, Florida, Hirshhorn remained a vigorous collector and patron of the arts until his death in 1981. His subsequent bequest to the museum nearly doubled the size of the collection. Today, building on this original foundation of artworks from Joseph Hirshhorn’s personal collection, the museum’s curators continue to refine and expand the collection, which today numbers more than 12,000 pieces. A consistent influx of new acquisitions invigorates and extends Joseph Hirshhorn’s legacy of passion for the art and artists of our time.